Let's briefly consider who the man Daniel was. Eight years later, when Jehoichin also rebelled, Nebuchadnezzar invaded Judah again, conquered Jerusalem a second time, and replaced Jehoichin with his uncle, Zedekiah. Ten years later when Zedekiah revived the rebellion, Nebuchadnezzar invaded a third time and decided he was fed up with Jewish rebellion. And so, in 587 BC the Babylonians totally destroyed the city of Jerusalem, including Solomon's Temple, and ended the Davidic line of kings. 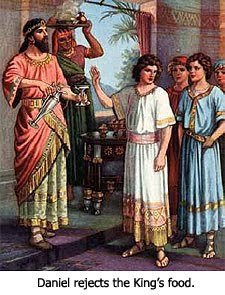 Daniel was only about 15 years old at this time, but he distinguished himself immediately as a person of spiritual maturity by refusing to pollute himself with the non-kosher food supplied to him by the king. In similar manner, many years later at age 82, Daniel imperiled his life by refusing to obey an order of King Darius of the Medo-Persian Empire that no one could pray for 30 days to any god except to the king himself. Daniel's refusal to abide by this command prompted the king to throw him into a lion's den, but his life was spared by a miracle of God. Daniel, throughout his life, was a man of faith and prayer and impeccable virtue. He is referred to by one of his contemporaries, the prophet Ezekiel, as one of the three most righteous men who ever lived, together with Job and Noah (Ezekiel 14:14). In a visitation made to him by the Angel Gabriel, recorded in Daniel 9:23, he was told, "You are highly esteemed" by God.